Reynolds’s cultivation of a network of aristocratic patrons was an important aspect of his success as a portrait painter. His portraits played a vital role in endorsing both the dynastic and political ambitions of the nation’s powerful elite. During a career spanning fifty years he often painted several generations of the same family, strengthening the power of particular dynasties through grand family portraits as well as more intimate studies of women and children. 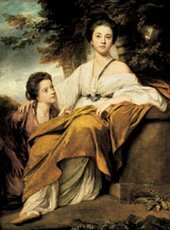 Reynolds’s celebration of the allure of the aristocracy reached a peak in a series of spectacular full-length portraits of titled women, exhibited at the Royal Academy during the 1770s. In these he again managed to blend tradition and innovation, using the madonna and child theme from old master paintings to celebrate the modern attitude towards motherhood adopted by aristocratic women such as the Duchess of Devonshire. By his death, Reynolds’s achievement in courting the aristocracy was unparalleled. His arch rival Thomas Gainsborough was buried modestly in a quiet churchyard; when Reynolds was buried in St Paul’s Cathedral his pall-bearers included three dukes, two marquesses, three earls, a viscount and a baron. 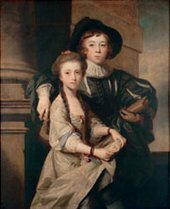 Reynolds exhibited this double portrait of the young, unmarried, aristocratic Montagu sisters in 1763. Elizabeth was twenty years old and Henrietta, who kneels beside her, was thirteen. Lady Elizabeth’s exposed shoulder presents her as desirable, but she is also defined by the pure, filial tenderness of a sisterly relationship. This would have formed a pointed contrast to the portrait of the celebrated courtesan Nelly O’Brien, which hung nearby in the exhibition. 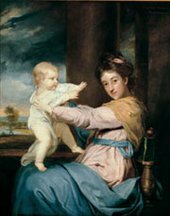 The Duke of Marlborough commissioned this portrait to celebrate the birth of his daughter in October 1763. He intended to hang it with his fine collection of old master paintings at Blenheim Palace. Appropriately, Reynolds based the poses on a mother and child in one of Michelangelo’s lunettes in the Sistine Chapel. He also took the mother’s slightly bowed head, her shawl and the ornate carved chair-back from Raphael’s celebrated Madonna della Sedia in the Pitti Palace in Florence. 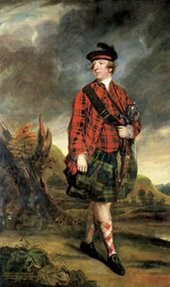 The Earl of Dunmore wears the Highland dress of the 3rd Regiment of Foot Guards. After the Jacobite rebellion of 1745-6, Highland clothing was restricted to those serving in Scottish military regiments. The blasted tree-trunk shows signs of natural regeneration: the leaves and the flowers emerging from the old tree. This imagery suggested that the Highlands, brutalised during the terrible repression of 1746-7, were now being restored to order by a new generation of Scottish noblemen loyal to the crown - like Murray himself. Lord Rockingham was a leading Whig politician who had been, and would be again, prime minister. He is presented in his public capacity, wearing the robes of the prestigious Order of the Garter, which dates back to the fourteenth century. 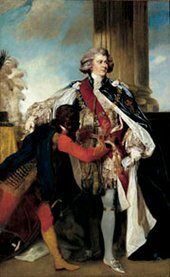 His clothing and the grand classical columns behind him promote Rockingham’s lineage and political authority: he is, the picture implies, a modern successor to the great aristocrats and statesmen of British and classical history. This brother and sister were both in their teens though John Joshua was, as his father’s only surviving son, heir to the family’s titles and estates, and Elizabeth was already of marriageable age. Reynolds’s presentation of the siblings was influenced by a double portrait by Rubens, from which he also took the boy’s elaborate ‘Van Dyck’ costume. But their outfits have become masquerade costumes, marking them out as aristocratic members of fashionable society. But amongst the THRONG we shall find,To be sure, The extravagant daughter of old Sir J—M—; Tis yon skittish FILLY in want of a Rider, So fond of the Levere’t SQUATTING beside her. This is a marriage portrait. Lady Bampfylde’s flowing white robes, and the white lily she points towards, are familiar emblems of purity. Her pose is a witty adaptation - in reverse - of the famous statue of the Venus de Medici. 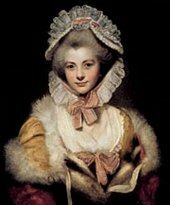 Reynolds’s idealised image belies the fact that Lady Bampfylde’s marriage was not happy. Even before he succeeded to the baronetcy, her husband had frittered away twothirds of his inheritance, and rumours abounded of her extravagance and infidelity. Lady Talbot is shown in Grecian dress, having just made an offering to the nearby statue of Minerva. Also known as Pallas Athena, the goddess variously symbolised wisdom, learning and the arts, qualities with which Lady Talbot is linked by association. Her pose is passive and elegant, and her decorously exposed body and captivating half-smile are the conventional components of the painted ‘beauty’. This portrait of the three Waldegrave sisters was painted for their great uncle, Horace Walpole, to hang in his celebrated house in Strawberry Hill. The sisters, all of whom were to marry in the following years, were single when the painting was commissioned. Their portrait, exhibited at the Royal Academy in 1781, would have advertised their eligibility and desirability. Individually and collectively, the Waldegrave sisters embody contemporary ideals of feminine accomplishment, style, and beauty. This portrait was begun only weeks after Lavinia’s marriage to George John, Viscount Althorp. Reynolds increasingly focused on the materials and textures of his female sitters’ fashionable dress; the Countess’s portrait formed part of a colourful, glamorous and theatrical parade of the president’s female portraits across the walls of the Great Room at the Royal Academy in 1782. 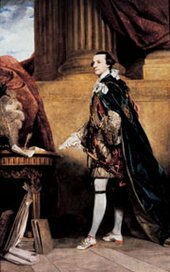 George, Prince of Wales, was the eldest son of King George III and heir to the throne. He was extravagant, debauched and self-obsessed. Here, in Reynolds’s portrait, the young prince seems to revel in his dubious celebrity. When the picture was displayed at the Royal Academy in 1785, satirical critics described him as looking out at, and flirting with, the young women in portraits hanging nearby. Reynolds’s portrait of the prince in his robes of the Order of the Garter took pride of place in the Great Room at the Royal Academy exhibition of 1787. Even so, the press slated the picture. Their criticism was mostly directed at the black servant leaning across to adjust the ceremonial robes. Some claimed the impoverished prince couldn’t afford a white servant; others said he was measuring the prince for a pair of breeches, or even taking his clothes off.